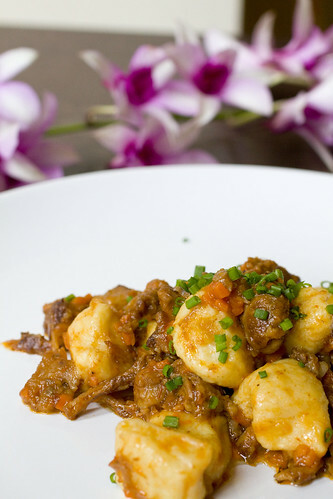 Fusion food sometimes sounds new and modern, like a fanciful restaurant theme. We forget that borders between countries and cultures have existed since far back in history, where ingredients, flavors, and recipes have been shared. My late grandma Olia (on the right, below) grew up near the border of China and Russia, where she ate lots of this Chinese version of Borscht. She taught my mom how to make it and my mom taught me. My mom admits removing the potatoes and sour cream from the version Grandma Olia taught her (most Chinese versions don’t include sour cream) and I’ll admit, I made a few changes too. My mom always used canned beets and since I’m not a fan of canned products (due to the BPA in the adhesive), I use fresh beets. I also cut the veggies into smaller pieces just to make it easier to eat. (Caya obviously in mind.) 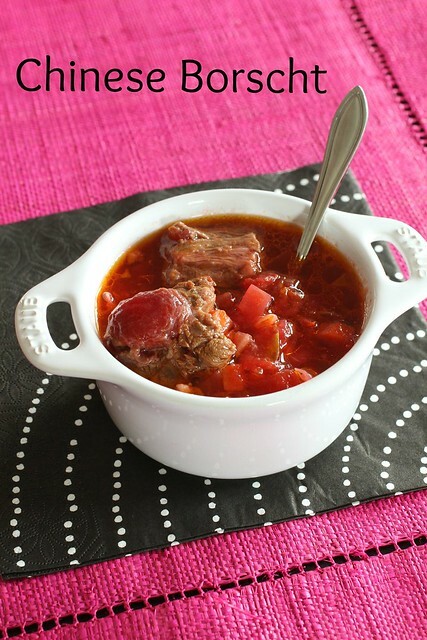 The result is a healthy and hearty soup with meat and veggies that glow pinkish-red (which totally amuses Caya). It comforts to the core and I get nostalgic every time I take a sip. 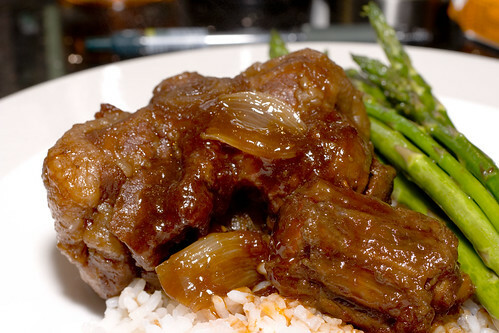 Oxtails in Chinese Tomato Sauce was a regular part of growing up. My brother and I loved this dish; we’re practically made of this stuff. So when I opened my fridge and stared at the oxtails, I knew I had to make it for Lon so I called me mom for instructions. It turns out, it’s ridiculously easy, so if you have kids, this will end up being a regular in your house. I didn’t have a single cousin (in my large family) that could resist this stuff. I love beef oxtails and try to use it in any beef recipe I can (see my Oxtail and Linguine recipe). It works especially well for soups and stews because the bones give off so much flavor to the liquid. 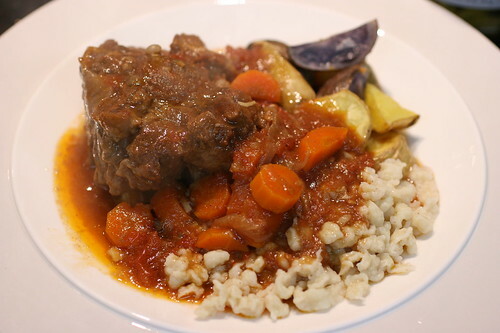 My latest oxtail conquest is Goulash, a Hungarian stew, which Lon grew up with. This is an easy dish that doesn’t require too much work, but it does require inactive time. As I sat, waiting for it to finish cooking, I started getting nervous wondering if my Oxtail Goulash would pass the test for Lon (of Hungarian descent) and it did, with flying colors! We had Martin and Melissa over for dinner last night and they loved my Oxtail and Linguini. Good thing I wrote down the recipe for my Oxtail Sauce. Four people almost finished the entire pot! I served it with linguine but it would be wonderful with pappardelle or fettuccine as well.